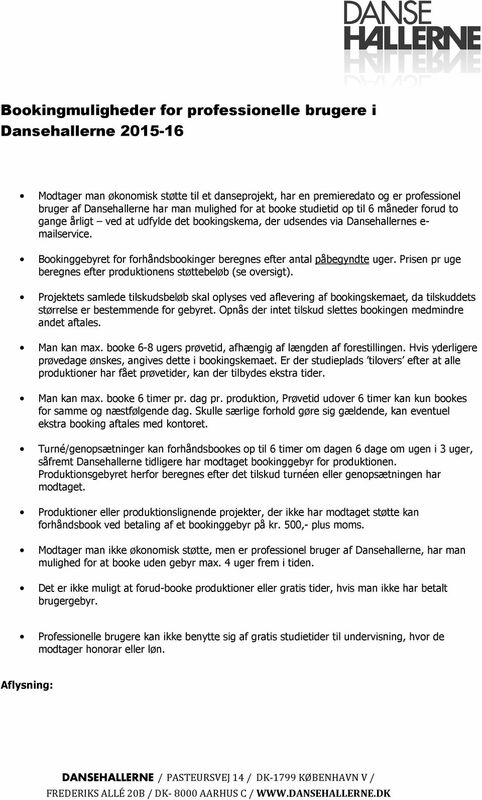 Download "Bookingmuligheder for professionelle brugere i Dansehallerne 2015-16"
3 Possibilities for studio booking in Dansehallerne for Professional Users If you receive funding for a dance project, have a premiere date and is Professional User of Dansehallerne you have the opportunity to reserve studio space up to 6 months in advance twice a year by filling in the form that will be distributed via Dansehallerne s service. The reservation fee is calculated by the number of started weeks. The fee per week depends on the funding the project has received (see overview). The in all funding of the project must be indicated on the reservation form, since the amount is deciding for the fee. If no funding is obtained the reservation will be cancelled if not otherwise agreed with Dansehallerne. You are able to reserve maximum 6-8 weeks studio space depending on the length of the performance. If space beside this is needed please write it in the form. When all studio space is planned the rest can be distributed to projects that need more time. You can reserve a maximum of 6 hours per day per production. Space for more than 6 hours can only be reserved on the same or the next coming day. If it is a specific case details can be arranged through the office. Productions and production like projects, with no funding may pre reserve studio space by paying a fee of DKK 500,- + moms. Tour and restaging are able to reserve up to 6 hours a day 6 days a week for 3 weeks, only if Dansehallerne previously has received studio space fee from the production. The fee for this kind of reservation is calculated on the base of the funding for the tour or restaging (see overview). 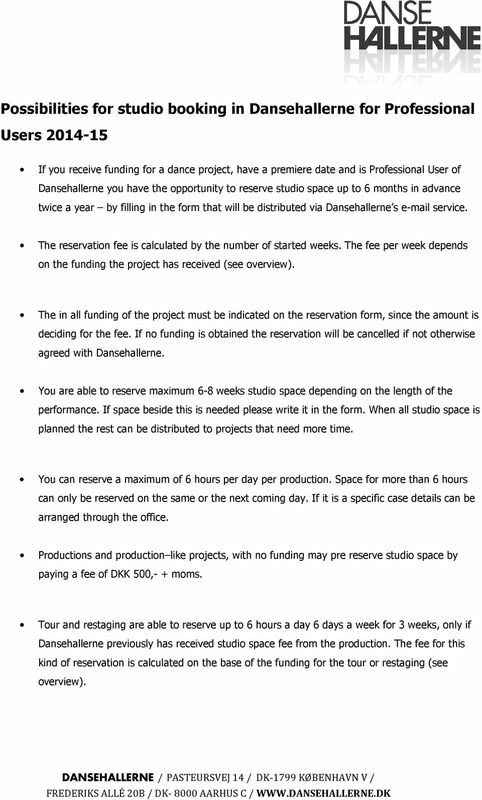 4 If you receive no funding but are a Professional Users of Dansehallerne you have the possibility to reserve studio space with no fee charged up to 4 weeks in advance. It is not possible to reserve any studio space if your User s fee has not been paid. 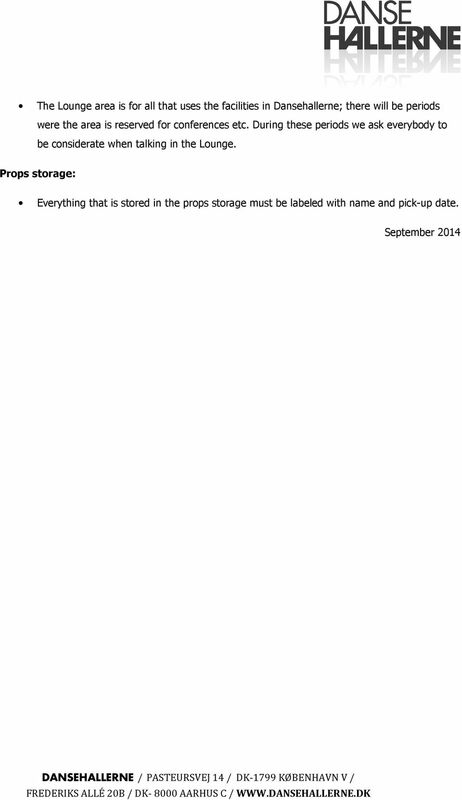 Professional Users cannot use the studio space without charge for teaching purposes - if you receive payment for this. Cancellation: Cancellation of studio space must happen as fast as possible - preferably online. If the cancellation is the same day it is not possible to use the online system. Please then contact the general office. 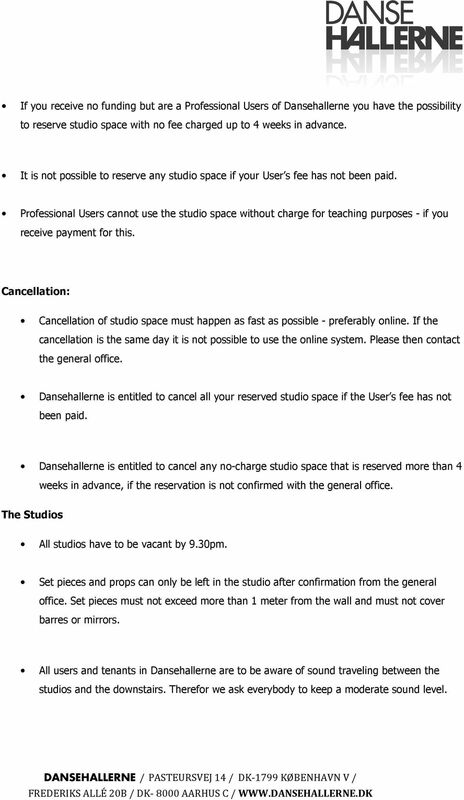 Dansehallerne is entitled to cancel all your reserved studio space if the User s fee has not been paid. 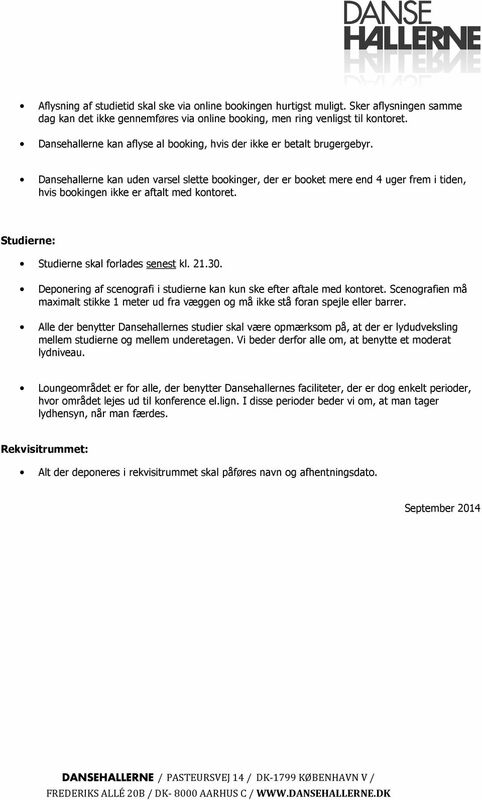 Dansehallerne is entitled to cancel any no-charge studio space that is reserved more than 4 weeks in advance, if the reservation is not confirmed with the general office. The Studios All studios have to be vacant by 9.30pm. Set pieces and props can only be left in the studio after confirmation from the general office. Set pieces must not exceed more than 1 meter from the wall and must not cover barres or mirrors. All users and tenants in Dansehallerne are to be aware of sound traveling between the studios and the downstairs. Therefor we ask everybody to keep a moderate sound level. Unitel EDI MT940 June 2010 Based on: SWIFT Standards - Category 9 MT940 Customer Statement Message (January 2004) Contents 1. Introduction...3 2. General...3 3. Description of the MT940 message...3 3.1. NOTIFICATION - An expression of care Professionals who work with children and young people have a special responsibility to ensure that children who show signs of failure to thrive get the wright help. Must I be a registered company in Denmark? That is not required. Both Danish and foreign companies can trade at Gaspoint Nordic. Brug sømbrættet til at lave sjove figurer. Lav fx: Få de andre til at gætte, hvad du har lavet. Use the nail board to make funny shapes. Hermed afrapportering som aftalt. Vi henviser i øvrigt til vores mail til Jer den 6/11 2008. E K S T R A O R D I N Æ R G E N E R A F O R S A M L I N G E X T R A O R D I N A R Y G E N E R A L M E E T I N G. Azanta A/S. J.nr. Danseuge for dig der vil lære at danse uden en partner Dancing without a partner and having fun in the Sun 08.01-15.01 15.04-22.04 17.06-24. Side 1 af 7 AUGUST Kære Frivillig, Om 4 uger går det løs på Bagsværd Sø og alle brikker falder stille og roligt på plads nu. De næste tre tirsdage vil du modtage en nyhedsmail fra os med relevant info. KOMDIS NYT. ABOBO = Pakker. located, we can also see it inside our system. Du kan gøre indsigelse, hvis du har købt en vare ved fjernsalg (køb på nettet), og varen ikke er leveret, fordi forretningen er gået konkurs. Vejledning til at tjekke om du har sat manuel IP på din computer.